ANYTIME, ANYWHERE, YOU CAN DEPEND UPON LUNA DI LUNA. With roots planted firmly in the picturesque vineyards of Italy’s legendary Tre-Venezie, renowned for its rich winemaking tradition and inventive spirit, Luna Di Luna created a revolution in winemaking that transformed the everyday wine experience. 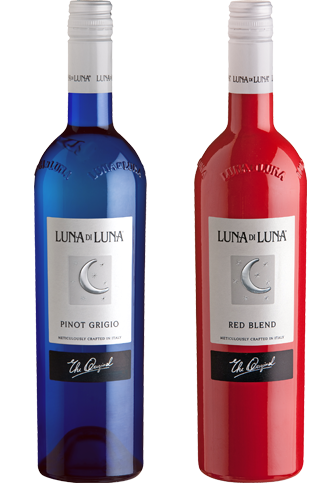 Originally crafted to create a more enjoyable wine experience, Luna Di Luna transformed how casual wine drinkers enjoy wine with its easy to drink taste profile, consistent quality and iconic bottles. Over the years the brand has earned numerous awards and a loyal following, proving to casual wine drinkers everywhere that any time, any day, for any occasion you can depend upon Luna Di Luna to provide the perfect wine. Crisp, clean, soft and harmonious on the palate with aromatic notes and hints of fruit. Floral, fruity bouquet. Bright and smooth. Strawberry and white pepper flavors with hints of toasty oak. Notes of red and black berries on the nose.